The East Empire Company has completed a full survey of the mineral resources available in the province of Morrowind and its surrounding areas. 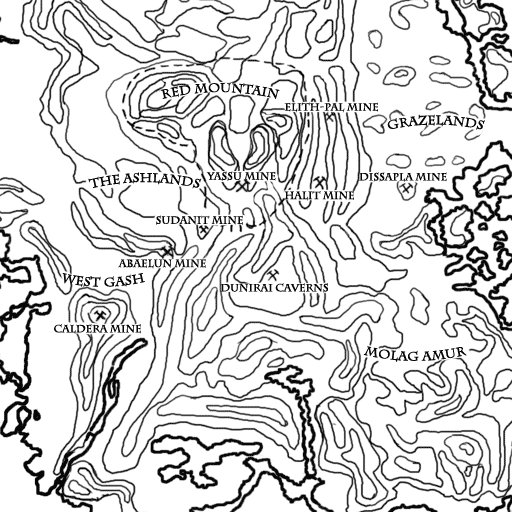 This report deals primarily with our most current discoveries on the island of Vvardenfell. The uses of each mineral will also be covered so our investors may understand the value in securing these resources for the Empire. During our investigations in Vvardenfell, we have also begun surveying the nearby island of Solstheim. We believe there are significant ebony deposits, and also deposits of Stalhrim, previously believed to exist only in Skyrim itself. We hope our newly established colony succeeds in securing these resources. Ebony is a rare volcanic glass, with the majority of these deposits found in abundance in the Vvardenfell region. One of the most precious substances in the Empire, it is protected by Imperial law. It is illegal to mine this ore or export it without an Imperial Charter. Mining this ore is a highly profitable endeavor to the East Empire Company, and we have several legal mining operations in the region. Our primary mining operation in Vvardenfell is currently the Elith-Pal mine in the northern Ashlands. Other mines are known to us, being run by the local Dunmer Great Houses. Caldera mine is currently run by the Hlaalu. However, rampant corruption has led us to conduct investigations into this operation. The Sudanit mine in the Ashlands is operated by the Redoran, and we currently have no objections to their legal enterprise. The East Empire Company is also investigating potential ebony deposits in Solstheim. Ebony is an extremely hard and durable substance, primarily used to create heavy armor and weapons. However, its weight and value prohibits extensive use for such purposes. Ebony weapons are sought after by the wealthy because it not only holds a sharp edge, but its weight can deal crushing blows, so long as the weapon is properly balanced. Only the most skilled craftsmen can unlock the true potential of this substance, and it can also absorb incredibly powerful enchantments. Ebony armor is primarily a status symbol, and is useful to lords who want to benefit from substantial protective enchantments. As such, the raw ore fetches a hefty price on the market. Large quantities must be used to create sets of armor, because ebony plates must be cut fairly thick to retain their durability. Once it is cut and polished, ebony gleams the purest black, and is often decorated with gold leaf or inlay. This ore also has some minor alchemical properties, but again, its weight and value make it not well suited to alchemy. Another rare volcanic glass found primarily in Vvardenfell, it is also a valuable commodity. Glass is less durable than ebony, but lighter and more flexible. The dunmer people use this ore to create unique armor and weapons that are little known outside of the province. It is our belief that demand for this substance can be increased throughout the Empire, and for this reason we have aggressively secured a number of mines in the province. The East Empire Company currently has mining operations in Halit mine and Dunirai caverns in the Ashlands, and Dissapla mine in the Grazelands. We have also found a mine in the Red Mountain region, and despite the dangers, have begun to establish a small mining operation in Yassu mine. Glass can be cut into thinner plates than ebony, yet still maintain its tensile strength. The innate flexibility of glass allows it to be used in lightweight weapons and armor. Glass armor uses other alloys as its base, with glass inlaid into the metalwork. It is superior in strength and durability to other light armors. In the light armor range, glass is also unparalleled in its ability to hold enchantments. Glass blades hold a sharper edge than most metals, which makes for superior swords and axes that are lightweight, flexible, and durable. However, it is not suitable for blunt weapons. The beneficial alchemical properties of glass are too few to be considered valuable for the purposes of alchemy. The value and weight of this substance also make such uses a complete waste of a valuable mineral. The East Empire Company has discovered diamond deposits in Vvardenfell. One of the most perfectly transparent gemstones, it is also one of the hardest substances on Nirn. It has great value to jewelers and alchemists alike. There is only one diamond mine in Vvardenfell. Abaelun mine is located in the West Gash region, and is run jointly between the Empire and House Hlaalu. We have not found any significant deposits elsewhere in the province. Diamonds have several alchemical properties, most quite modest and better served in other substances. Also, their value prohibits extensive use for such purposes. Nevertheless, many alchemists stock this ingredient solely for its rare invisibility effect. Though we have not found emerald deposits in Vvardenfell, we do excellent trade importing this rare gem into the province. Emeralds are high in demand by local dunmer jewelers and alchemists; as such, The East Empire Company profits greatly in this area. It has two alchemical properties that make it a valuable ingredient to alchemists. Ruby deposits have not been found in Vvardenfell, so we make steady profits importing this gem into the region. Aside from its use in jewelery, it also has two alchemical properties which make it a valuable commodity to alchemists. Adamantium is one of the rarest ores on Nirn, and can only be found in the province of Morrowind. Our recent survey of Vvardenfell has found no adamantium deposits on the island. So far this rare metal has only been found in small quantities on the mainland. Though the raw ore itself is incredibly heavy, once refined, it makes armor and weapons of a medium weight. The plates can be hammered thinner than any other known metal and still maintain its extreme durability and strength. Polished adamantium shines brighter than silver and, unlike silver, does not tarnish. In the medium armor range, adamantium is also superior to any other metal in its enchantment value. Because of its rarity and quality, only the extremely wealthy can afford armor made from this precious metal. It is in high demand by the High Imperial Royal Guard. The East Empire Company is currently working to secure significant quantities of this metal to supply His Imperial Majesty. This extremely rare material has been found in Solstheim, once used by ancient nords in their burial rituals. It can be used to fashion high quality medium armor and weapons. The East Empire Company has a vested interest in claiming deposits of this rare ore in Solstheim. It has some interesting alchemical properties, but its value and rarity makes such uses prohibitive.